DECKS : Most skateboard decks are made using Veneers of North American Maple, a durable and flexible wood. Normally are formed with a 7 ply construction, veneers are glued and layered on top of one another before getting formed by an hydraulic press, and finally get cut with the desired shape. There are many different shapes and sizes, for all the different kinds of Skateboarding, here you can learn the different parts and shapes of a board to choose the right one for you. The most important part of choosing a skateboard deck is the width. Width will determinate how comfortable you feel on your board to practice your kind of skateboarding. Other parts are also important, but with the practice you will learn to consider them too. WIDTH : Most decks range from 7.5" to 10" in width. 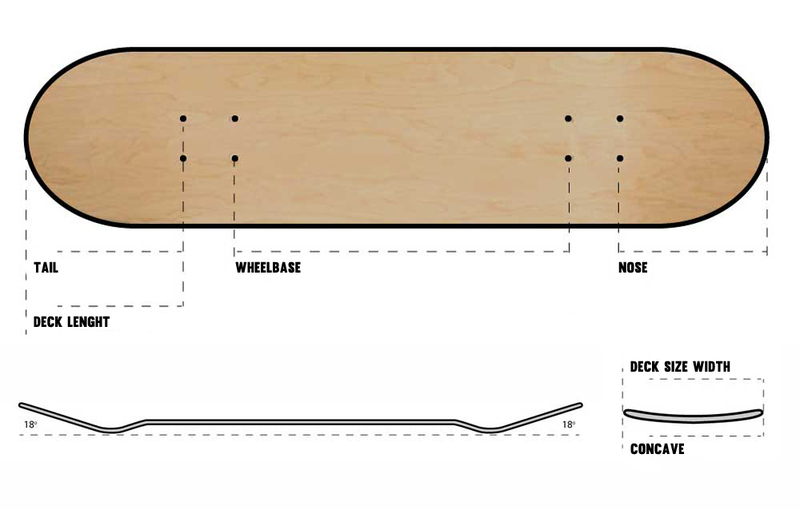 Narrower decks are the most recommended for street skating, lighter and easier to move to do flip tricks. If you are looking to skate transitions, a wider deck is probably best for you. NOSE : The nose is the front end of your skateboard deck and normally is thicker and a bit longer than the tail. TAIL : The tail is the back end of your skateboard deck and normally is thinner and a bit shorter than the nose. CONCAVE : The light sunken in the deck surface is the concave. The sides of the board between the nose and tail are curved upwards. Concave gives riders more control and also improves the deck strength. WHEELBASE : Is the distance between the mounting holes. If you are getting into skateboarding, it will be important to get familiarized with the different types of boards that skateboarders use. Basically there are four different shapes. POPSICLE : It's the most commonly used and evolved shape, for street skate and transitions. It's most important characteristic is the symmetry. It was finally introduced around 1994, and since then it has been basically the standard shape, modifying only the width, concave or length. OLD SCHOOL : There are many different variations in Old School Shapes. They were the Standard shapes during the 80's, until 1992. Normally are asymmetric, kicktail bigger than kicknose, and width starts at 9". Today are commonly used to skate transitions or as cruisers. Some old school brands, are doing reissues of their classics, and are very appreciated by Skateboard Collectors, or nostalgic skaters who wants to skate again the classics. CRUISER AND LONGBOARDS : Cruisers are normal mid-length, with kicktail, and designed only for cruising around for its good maneuverability. Longboards have also been designed for cruising, but some are used for downhill and are longer than a skateboard, symmetrycal shape and with wheel cutouts to use bigger and faster wheels. Note : In transition between Old School and Popsicle shape, there were other shapes as Double Kick, wide boards totally symmetrical with double kicktail, and also the Football Shape, being the predecessor of the popsicle with a narrowed nose and tail. 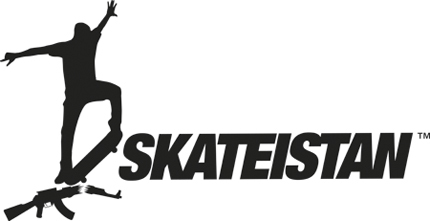 Resume : If you are interested in street skating, the best will be to use the narrower width size, the deck will be lighter and easy to move for flip tricks. 7.75" to 8.125" will be perfect. To skate transitions, we recommend you a wider deck, and old school shapes, this decks will provide you more stability . Decks from 8.125 are ideal. If you are looking to skate a bit of everything, then we recommend you a width size between the narrower street decks and the wider transition decks, a width between 8" and 8.38".